Russell George Bosisto was born 18 August 1893 in the district of Hindmarsh, Adelaide, South Australia to Ernest Montgomery Bosisto and Annie Mari Gurney. He grew up at Medindie and became an apprentice baker after leaving school. Bosisto enlisted at Keswick on 15 March 1915 (under the name George Russell) and became a member of the 1st Reinforcements of the 27th Battalion. The battalion embarked from Adelaide aboard HMAT Geelong on 31 May 1915 for Egypt and served at Gallipoli from September 1915 in a supporting role, suffering few casualties. After the withdrawal of Australian troops at the end of 1915 the battalion returned to Egypt. In late March 1916 Bosisto’s battalion then proceeded to France where he was to experience the frontline trenches for the first time. The battalion took part in its first major battle at Pozières between 28 July and 5 August. On 12 August 1916 Bosisto was reported missing in action from 4 August. On 14 October this was revised to killed in action. However, there was evidently a delay in communicating this to his family as his mother wrote to the South Australian Red Cross Information Bureau for news of Russell. She included a letter she had written to be passed on to him as she believed him to be missing or a prisoner of war rather than killed. 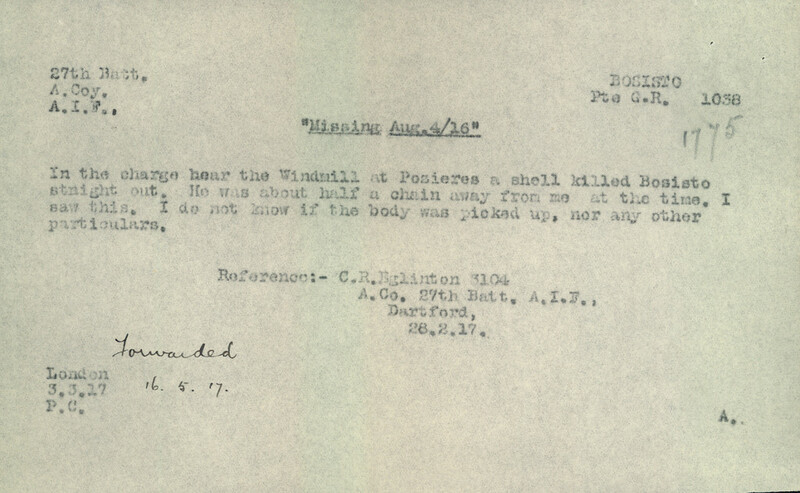 The South Australian Red Cross Information Bureau packet does not include her letter but the response from the Bureau outlines several witness statements which declare that Bosisto was posted near the Windmill at Pozières and was killed outright when hit by a shell. Bosisto’s remains were not able to be recovered and buried. Bosisto was commemorated on the Australian National Memorial, Villers-Bretonneux, France, like so many others whose final resting place was not known. However, in January 1998, a farmer unearthed the body of an Australian soldier wearing Bosisto’s dog tags. Following official identification of the body as that of Russell George Bosisto, he was reburied on 5 July 1998 at Courcelette British Cemetery in France. 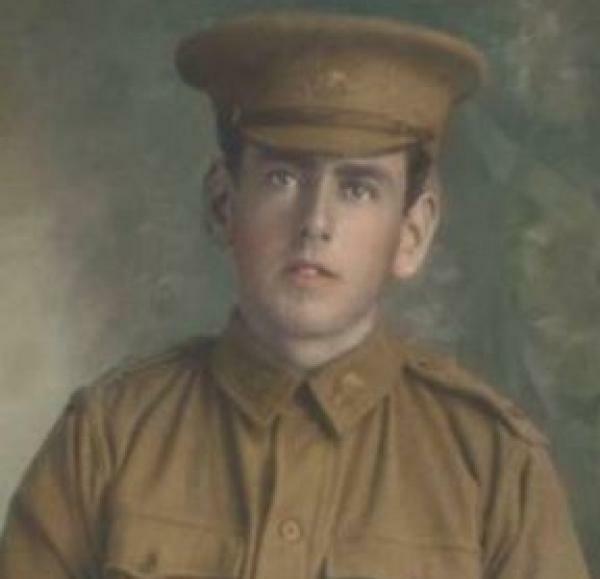 The funeral was attended by soldier’s from Bosisto’s battalion (now the 10/27th) and four Australian World War One veterans, including Howard Pope also a member of the 27th Battalion and featured in the SARCIB records.